One of the things I have discovered about being a parent is the sheer amount of stuff you end up carrying about. When my boys were babies, it was little cups, bibs, nappies, wipes and spare clothes. Now they’re older, there’s not much less stuff, it’s just different stuff! No cups now, but bottles of water, macs, jumpers, post its and pencils (a great distraction if the smaller ones are getting restless! ), cameras and assorted rocks, twigs and bus timetables they pick up while we are out. Last summer, while we were in Germany, my husband was carrying all this stuff about, and it occurred to me that my no longer babies were perfectly capable of carrying this stuff for themselves! So I came up with a design for an easy backpack. As I was going to need to make 4, I needed them to be easy and quick to make. I also needed them to be big enough and strong enough to hold their clobber, without being too big. The bag part is very simple. It’s 2 rectangles sewn together with boxed corners. 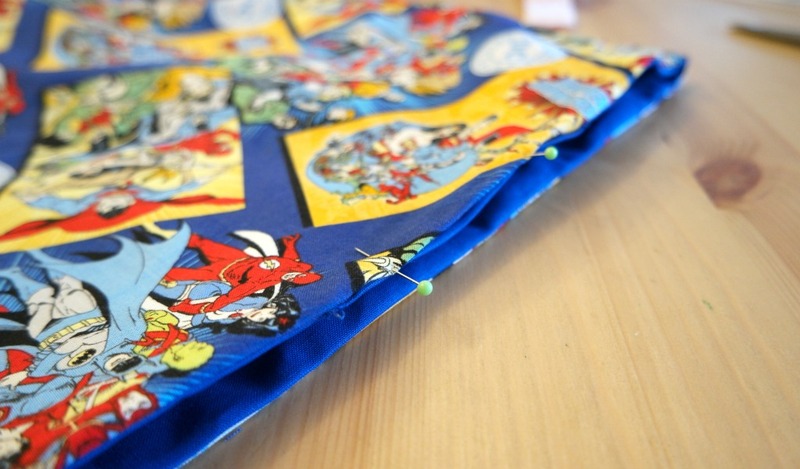 The lining is made in the same way, then they are sewn together at the top. 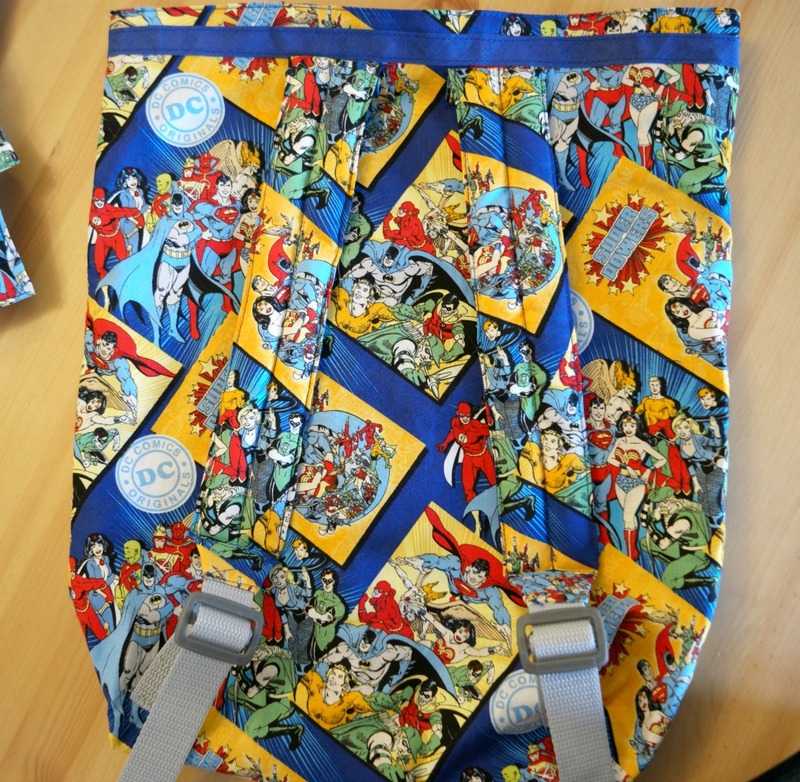 When sewing a backpack, if you use plain fabric or a non directional print. Then you wouldn’t even need to cut the rectangles. You could just fold the fabric in half instead. 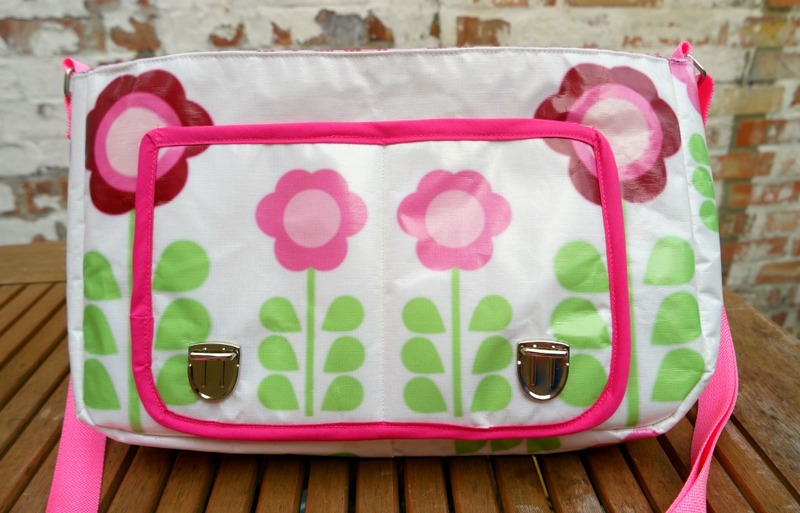 Once the bag part is made, the casing is sewn to the outside. I used bias binding in the same colour as the lining. Each bag has a different lining so that the boys know which bag is theirs. 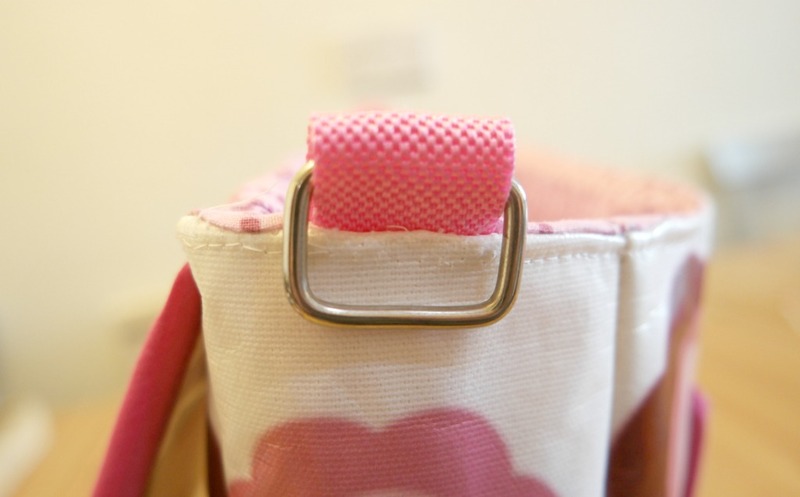 The straps have some wadding in them to make them comfortable to carry. 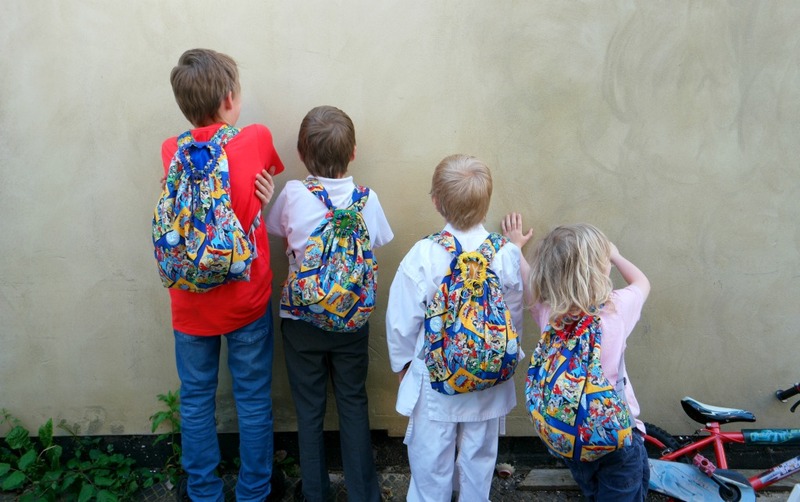 I don’t want to end up carrying 4 little back packs! I sewed webbing to the ends of the straps and 2 more pieces of webbing are sewn to the bottom corners. 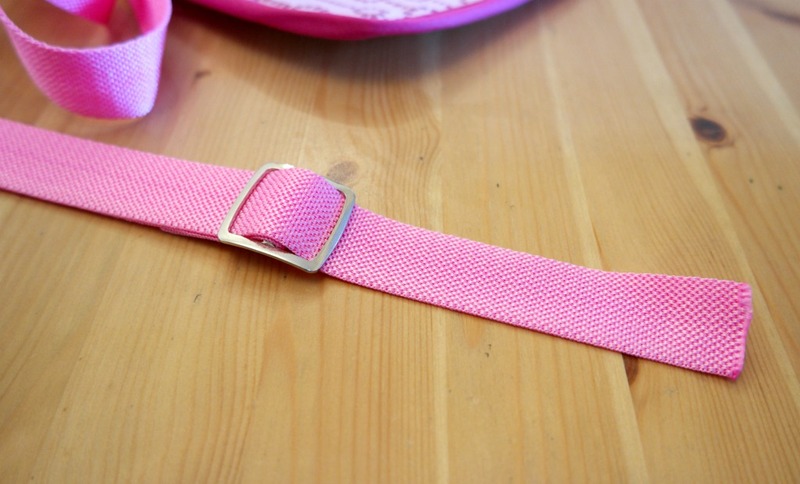 A plastic buckle makes the straps adjustable, so I could make them all the same and then adjust them according to the size of the boy. To finish them off, I threaded the casing with coloured elastic and added a toggle. 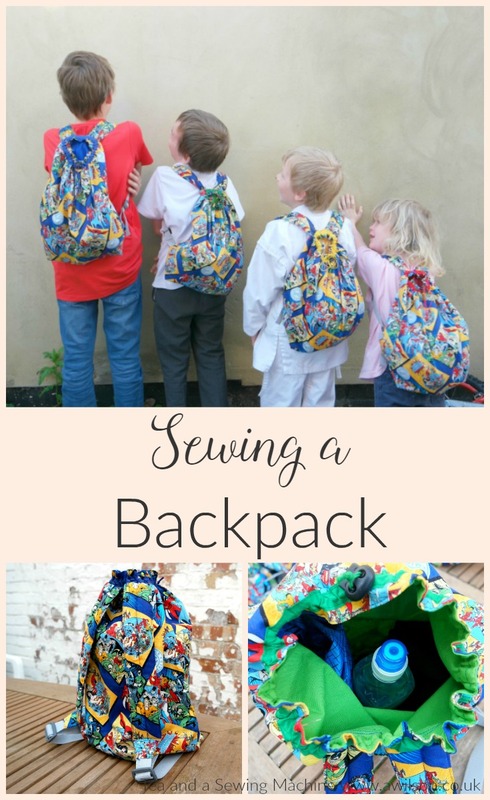 Sewing a backpack is simple and fairly quick to do. However I am ashamed to admit that I although I finished one, the others ended up in the unfinished projects pile. I took my own advice to start with and batched them, but I wanted to get one finished so that I could post the tutorial. So one got finished and the others didn’t. 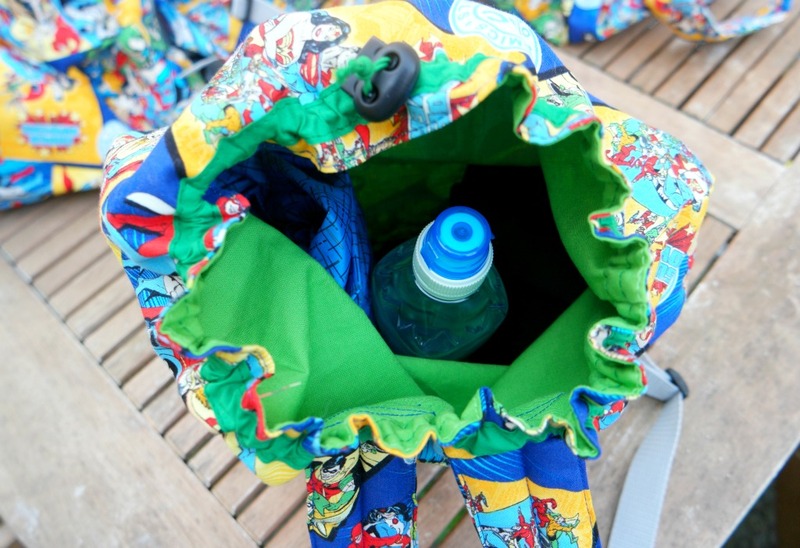 We have had some trips away since, but they were to cold places and at cold times of the year so people were going to be wearing waterproof coats and were unlikely to need bottles of water, so the backpacks stayed unfinished. Now the warm weather has come back round again and we’ve got a trip planned to the Peak District. The boys are going to need their macs and things, so I got them out again and I’ve actually finished them! When I retrieved them I found that I’d done more on them that I had thought! All I needed to do was sew on the straps and the webbing and thread the elastic through the casing. 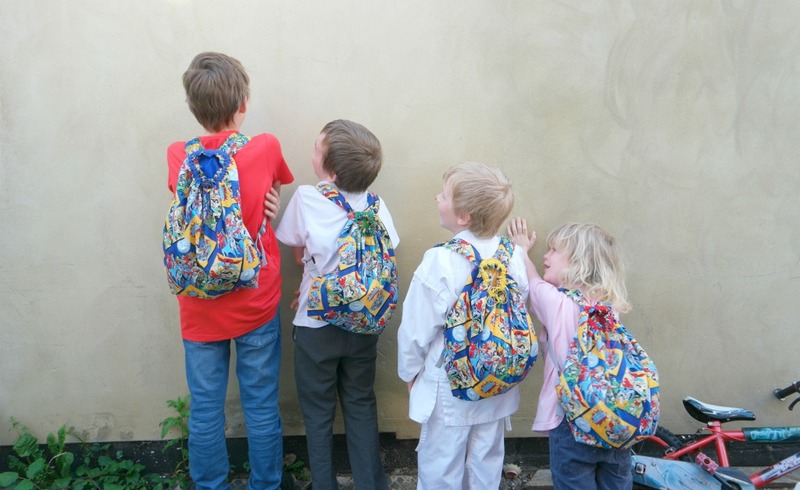 Each boy will have his own bag with his water, camera, mac and micro fleece. They can also carry their own rocks and bus timetables. 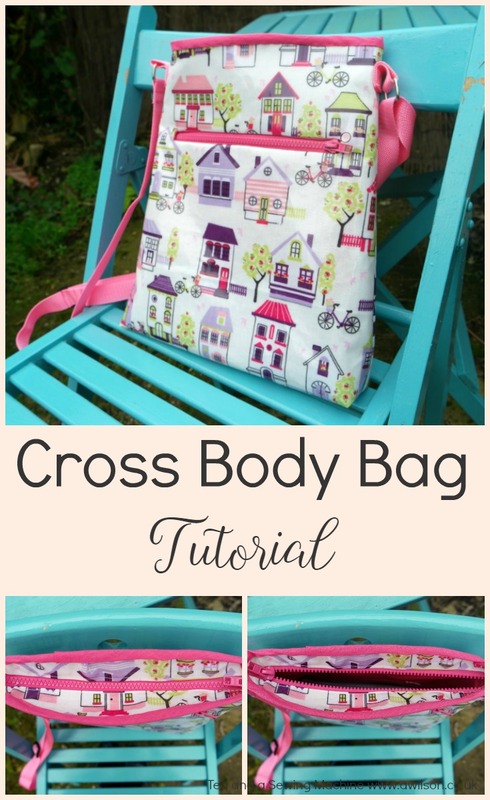 If you want to read the full tutorial for sewing a backpack, you can find it here. The fabric is fun isn’t it? It came from Minerva Crafts, along with the webbing. These are affiliate links. 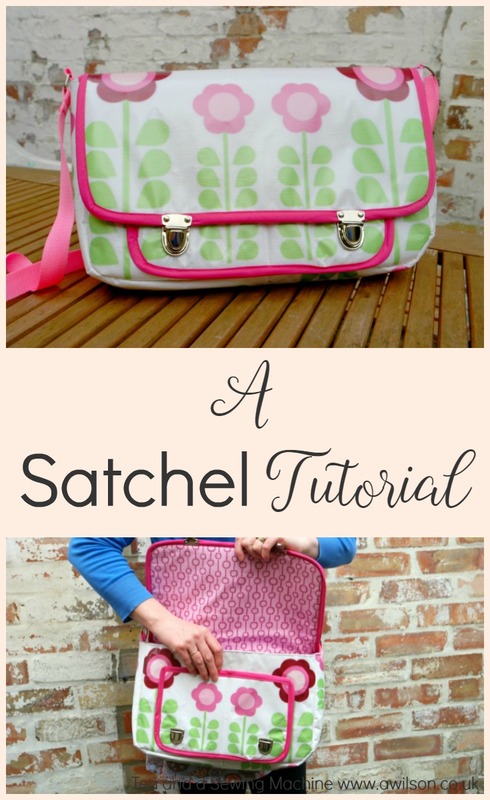 This satchel tutorial has been on my to do list for a long time! 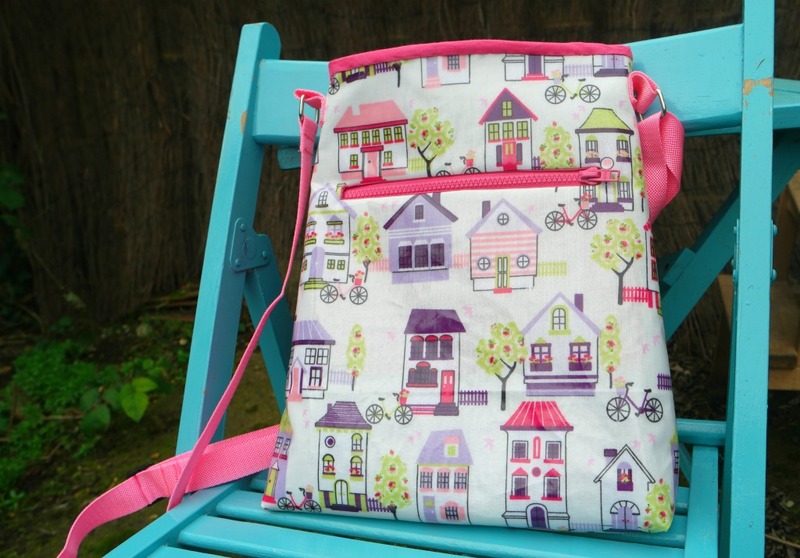 I wanted to make a bag that was big enough without being huge, with pockets but not too many and in a fabric that I loved. Designing the bag was no problem. The problem was finding the perfect fabric! 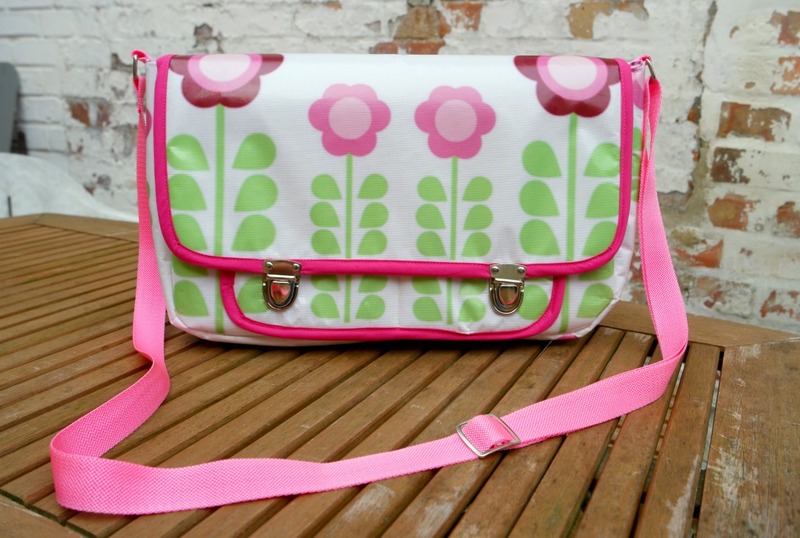 I wanted it to be oilcloth because I needed it to be waterproof, but after hours of searching the internet I still hadn’t found what I wanted. 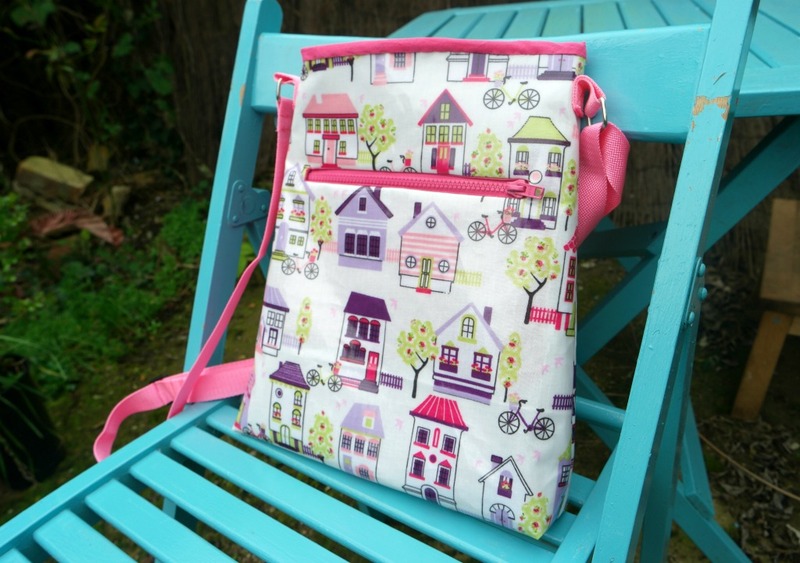 Then I discovered that I could have my own design printed onto oilcloth. Problem solved! 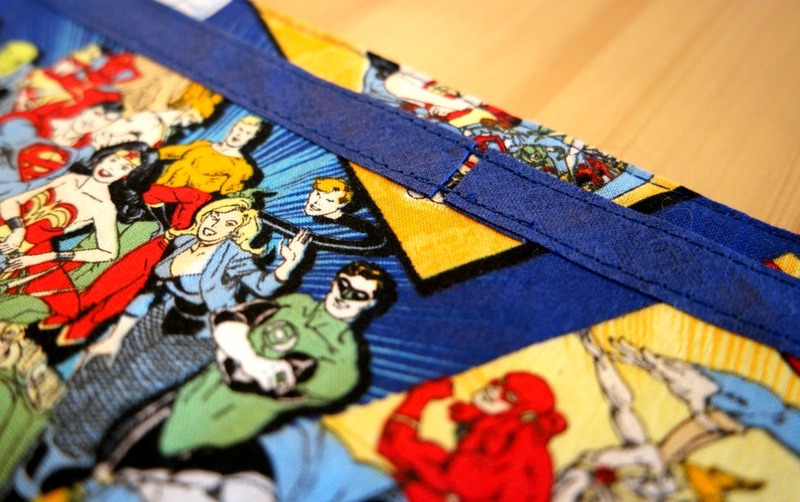 One site that offers printing onto a variety of fabrics is Contrado. I love Scandinavian retro prints at the moment, so I designed something along those lines. I used Canva and Picmonkey, then uploaded it onto the Contrado site. They printed it and sent it to me and I had it within a week! I love it! I was able to get the flowers the correct size so that I could have 4 on the main sections of the bag, and pattern match the pocket on the front. The bag has an internal divide and 2 pockets on the front. 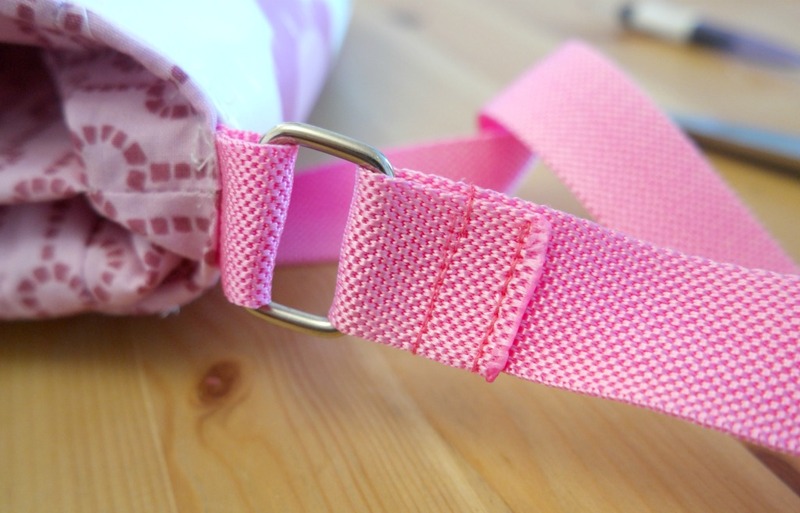 I made the strap out of webbing for convenience, but if you want something thicker and wider, you could sew a strap instead. 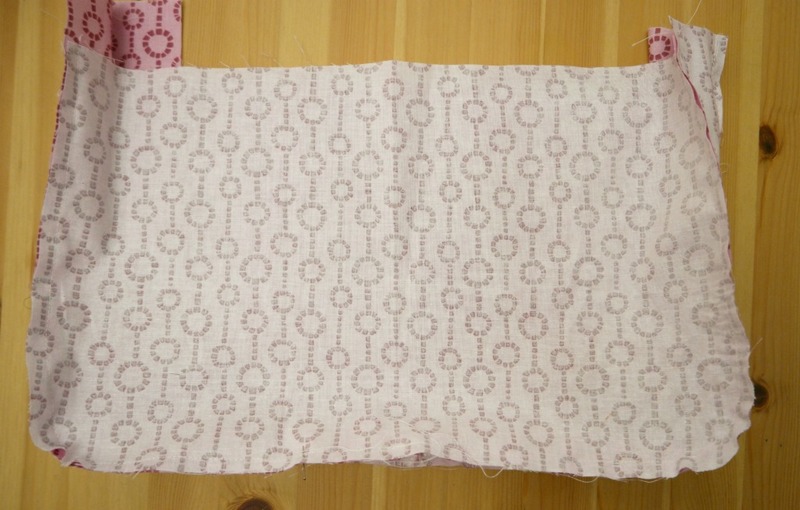 I also used Annie’s Soft and Stable instead of normal interfacing. 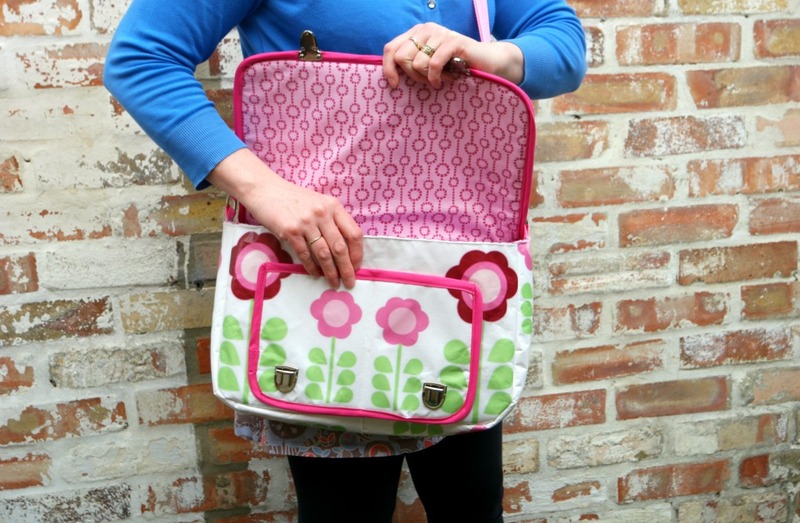 It was the first time I’ve used it, on the recommendation of Vicky of Vicky Myers Creations. I don’t think I’ll be going back to the regular stuff, for bags at least! 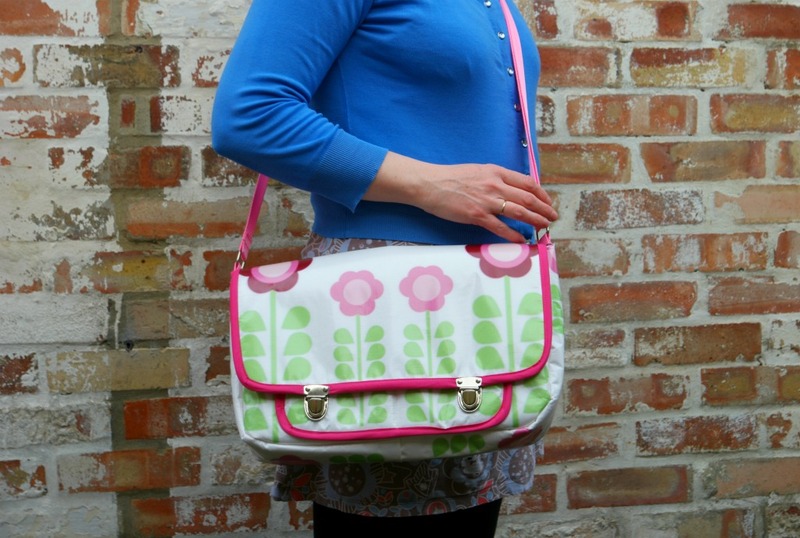 Here’s the satchel tutorial (and I have the pattern for sale on Etsy here). 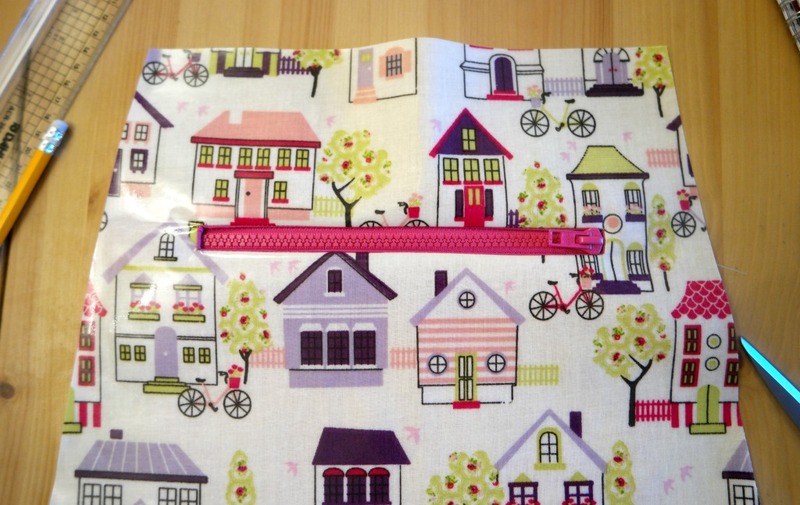 Fabric for the outer (oilcloth or some other heavy weight fabric is best. Anything lighter will need interfacing to give it some weight), fabric for the lining, interfacing (I used Annie’s Soft and Stable. 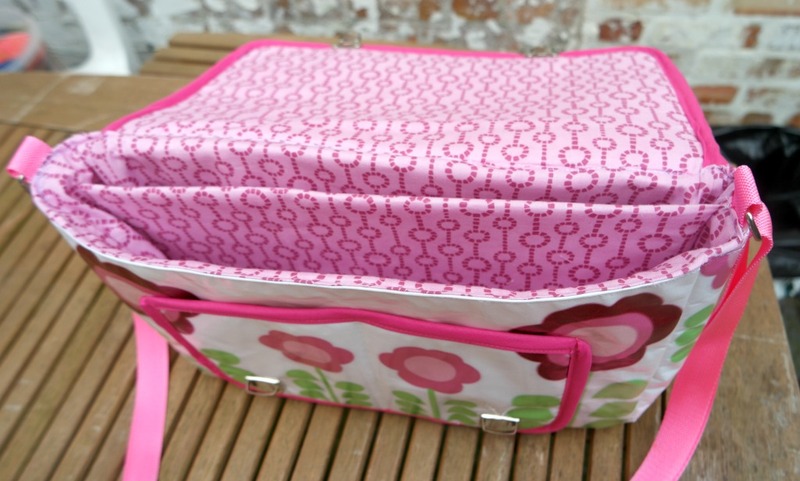 ), 2 tuck locks, bias binding, webbing, buckle slider, D rings, usual sewing supplies. 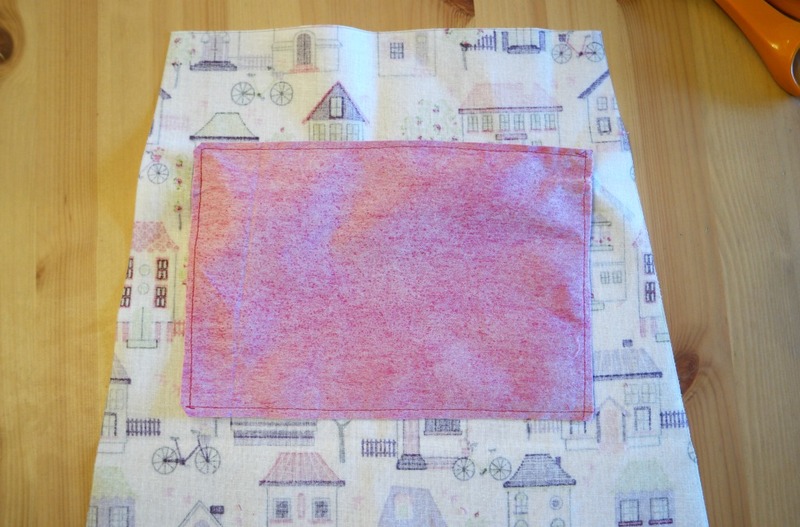 For the pocket, cut 1 rectangle 27 cm x 17 cm from outer, lining and interfacing. 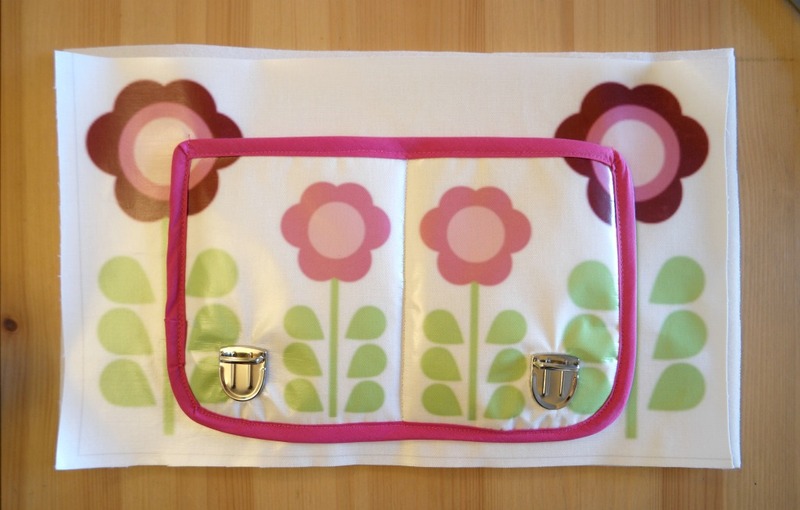 For the front and back pieces, cut 2 rectangles 39 cm x 24 cm from outer, lining and interfacing. For the gusset outer, cut 1 piece 10 cm x 92cm. 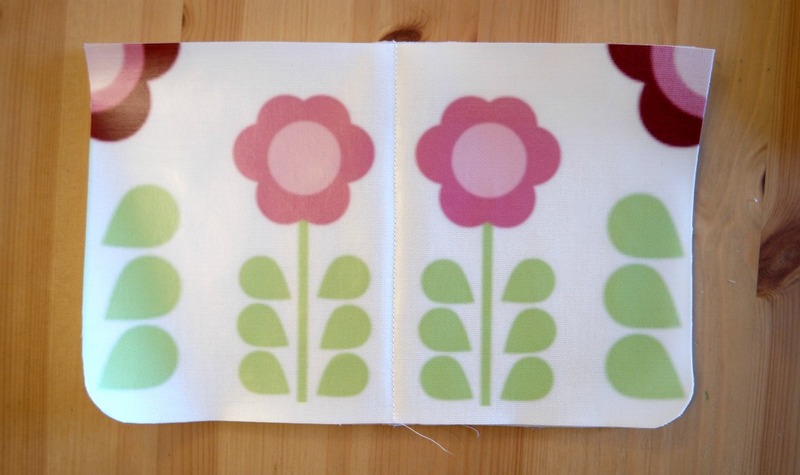 You could either cut this as 1 piece on folded fabric, or as 2 pieces 10 cm x 46 cm. 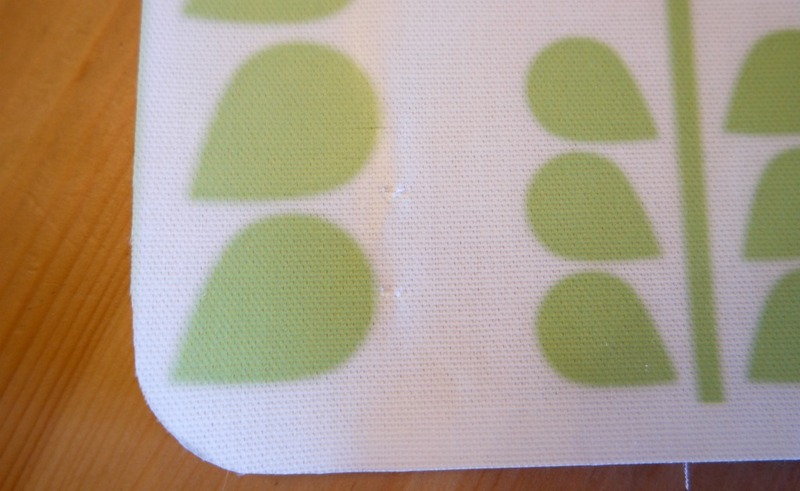 You’ll need to do the 2nd option if you’re using fabric with a directional print. For the gusset lining, cut 2 pieces 6 cm x 92 cm. 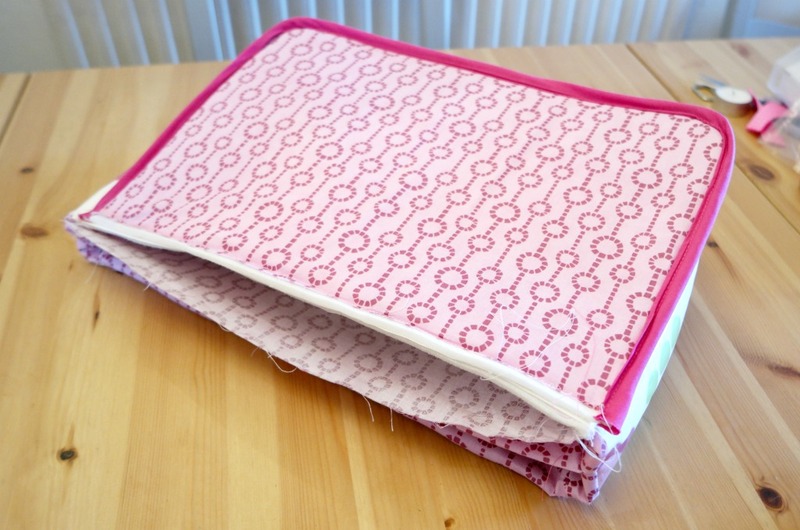 As with outer, you could cut this as 2 pieces 6 cm x 46 cm, cut on the fold, or as 4 pieces 10 cm x 46 cm. 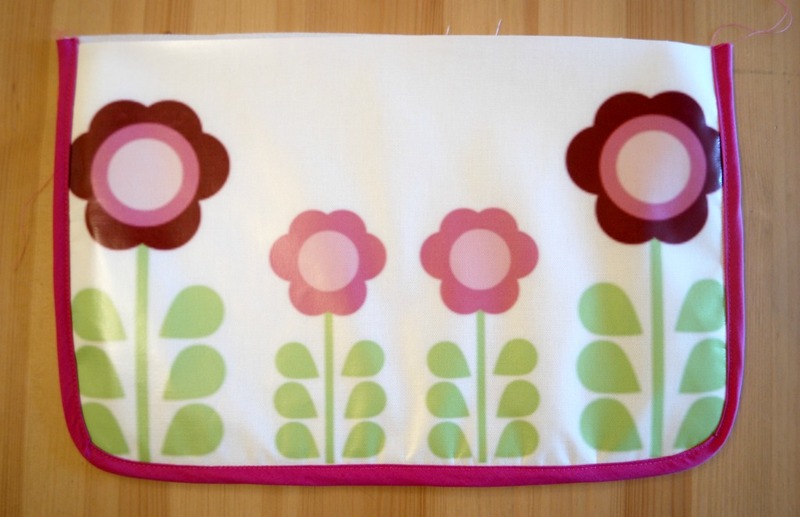 For the flap, cut 1 rectangle 37 cm x 24 cm from outer, lining and interfacing. 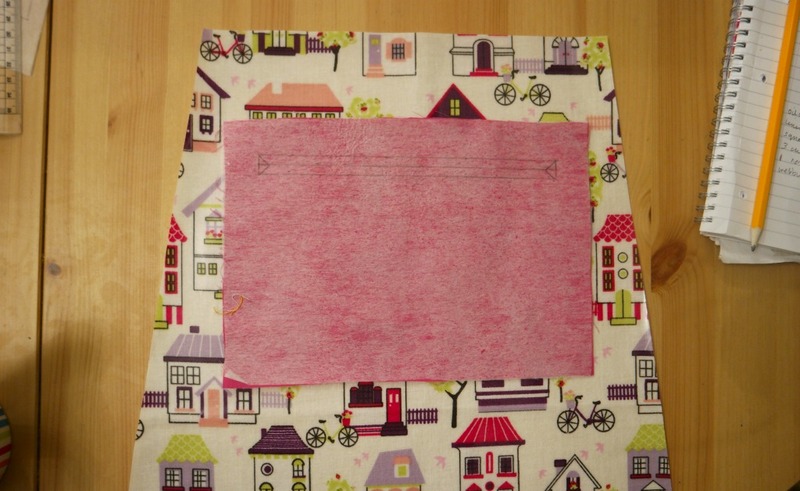 For the internal divide, cut a piece of lining fabric and a piece of interfacing 46 cm x 41 cm. If you’re using foam or Annie’s Soft and Stable for the divide, cut it 46 cm x 20 cm. 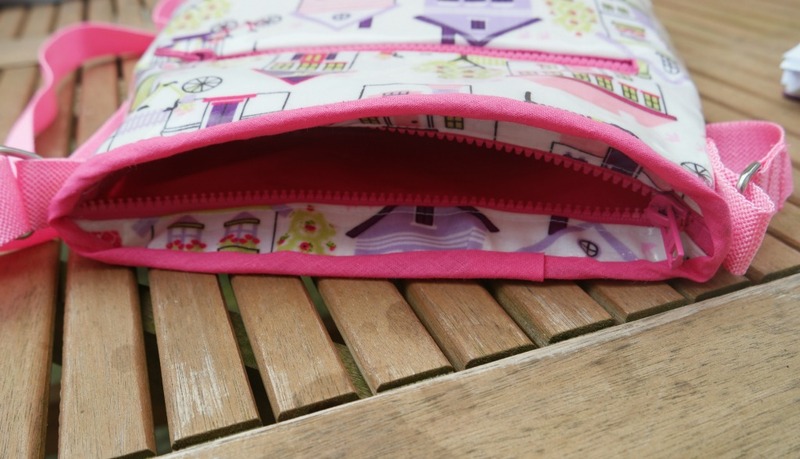 For the front and back, flap lining and pocket, you might like to round the corners. 1. Take the pocket lining and place it face down. 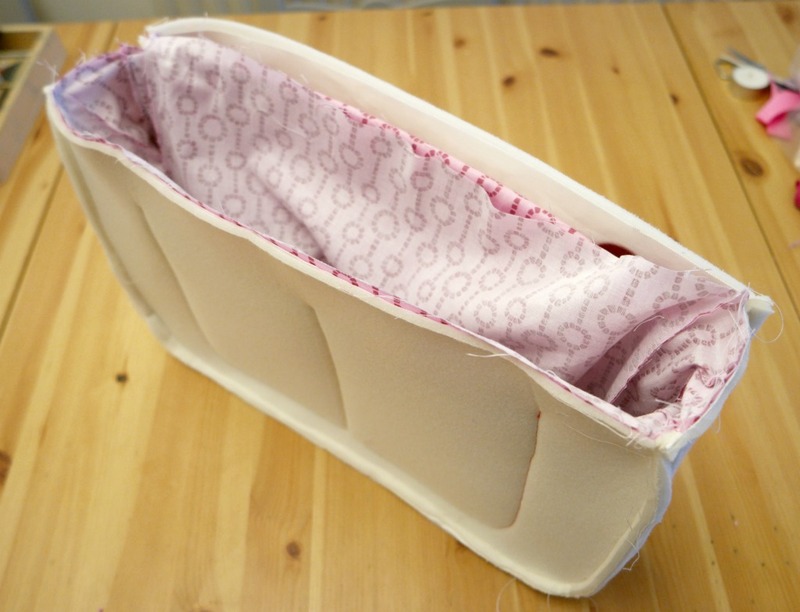 Put the interfacing piece on top of it, then the outer piece face up. 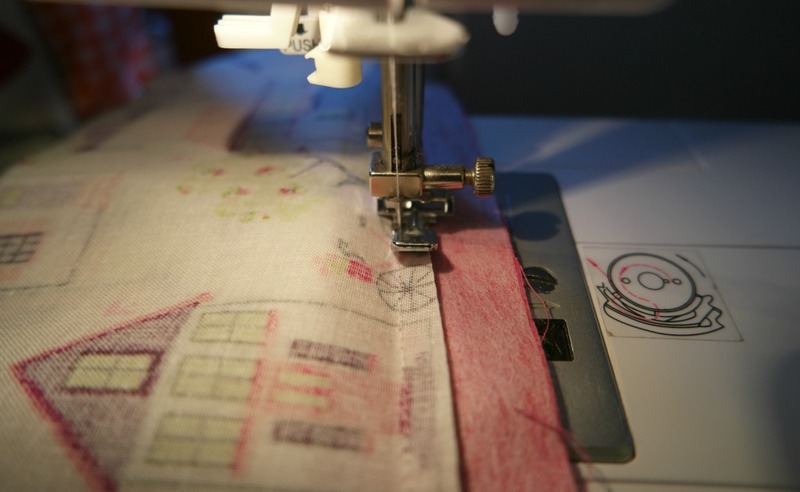 Sew down the centre. 2. 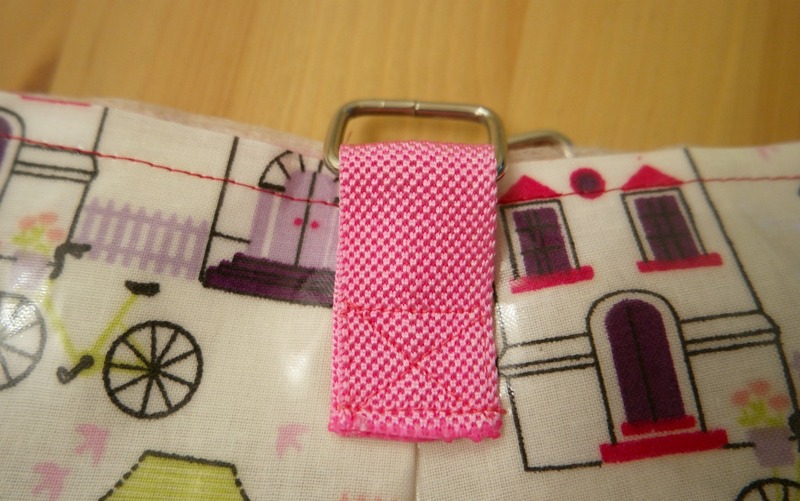 To attach the bottom part of the clasp lock, check that the feet are unfolded and straight, then press down onto the fabric. The feet will leave a mark. This is where you’ll need to cut 2 little slits to push the feet through. The locks need to go in the corner of each pocket. 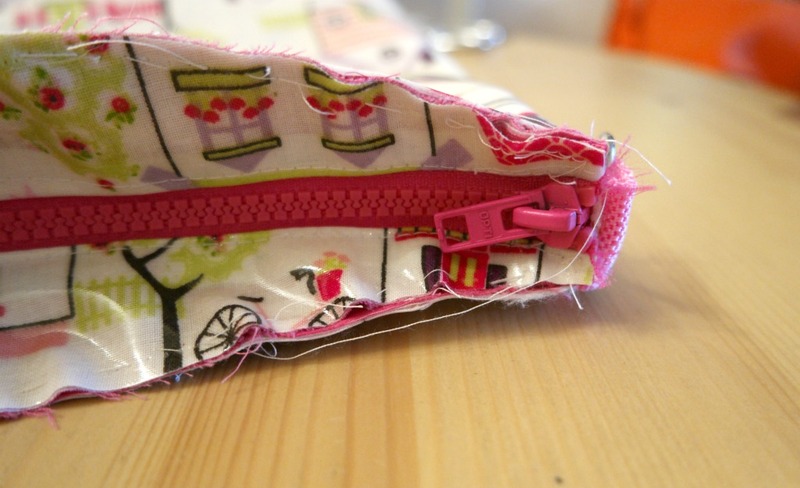 You’ll be sewing bias binding around the edge in a minute, so just make sure there’s enough space for that too. 3. Push the feet through the slits that you made in the previous step. 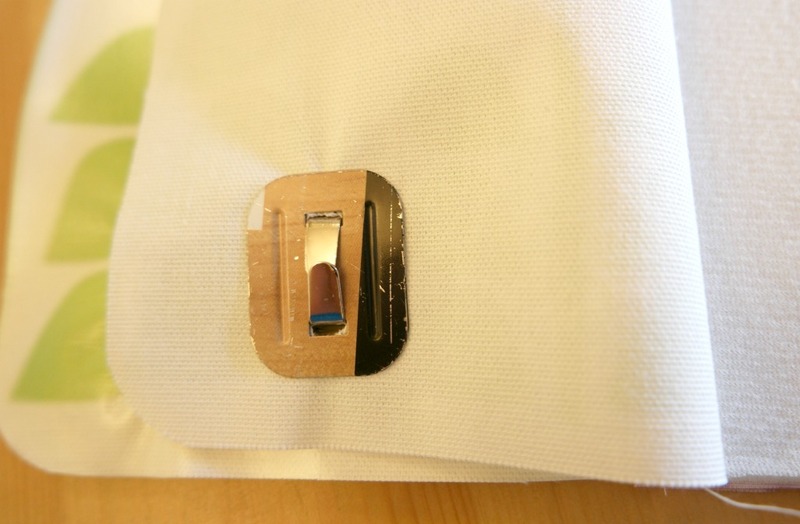 You might want to push them through the interfacing too. 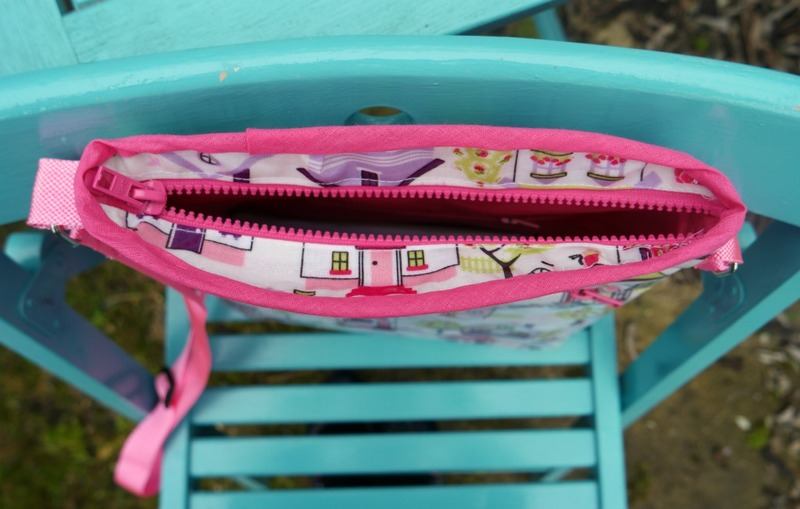 I found that the Annie’s Soft and Stable was a bit thick and caused puckering, but as the oilcloth is fairly thick anyway, it was fine. If you are using a lighter fabric, either push them through the interfacing or fuse some extra to the wrong side of the outer. 4. Slip the metal back piece over the feet and fold the feet over. 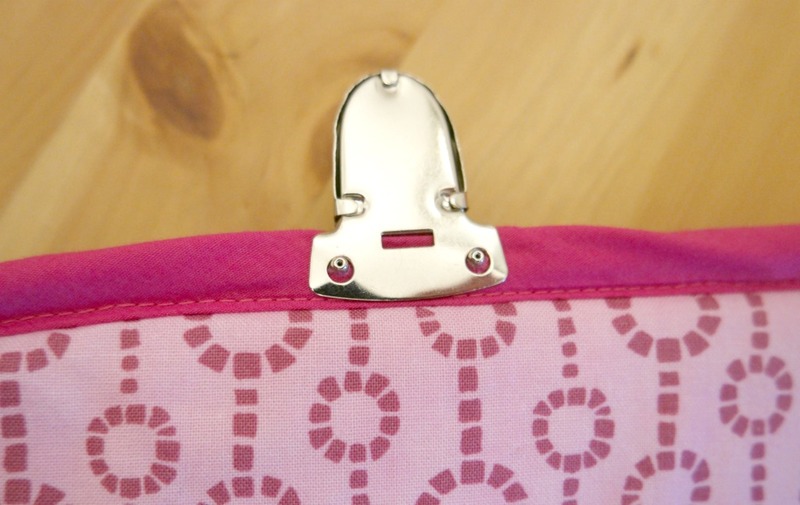 If you find it puckering, adjust the slits (they’ll be hidden by the buckle) and try to bend them over less tightly. 5. 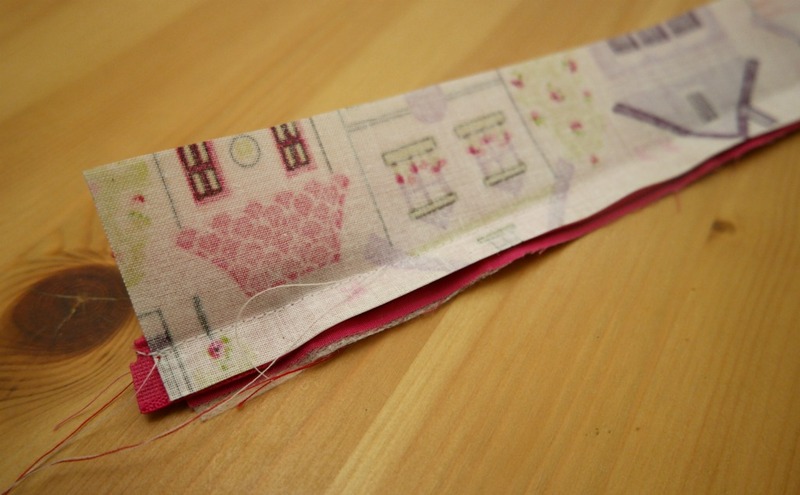 Starting with the wrong side, sew the bias binding around the outside edge of the pocket. Remember to turn the end over before you start. 6. 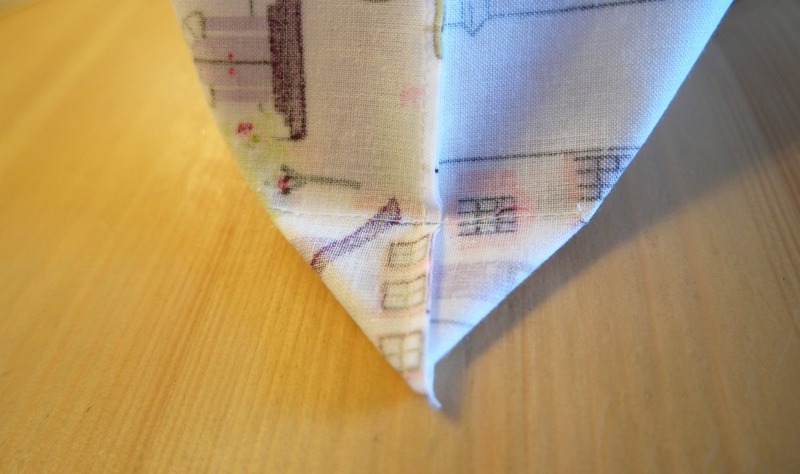 Fold the bias binding over to the right side and top stitch all the way round. The outer pieces are all sewn with the interfacing. 1. 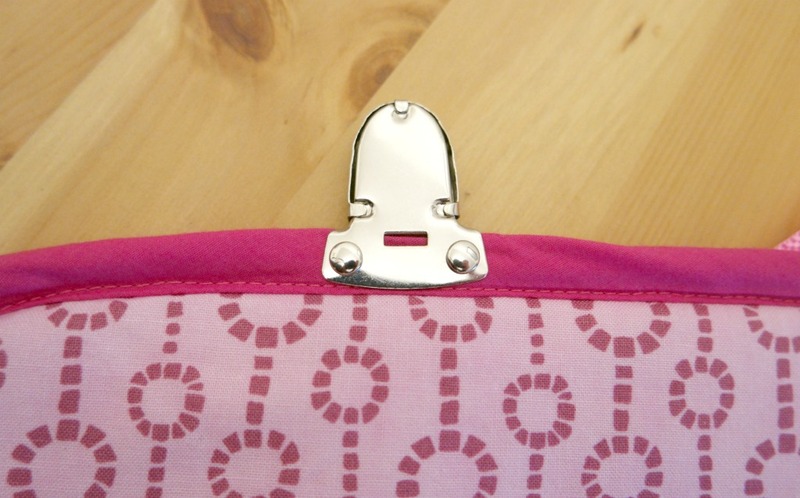 Position the pocket on the front piece of the bag outer. 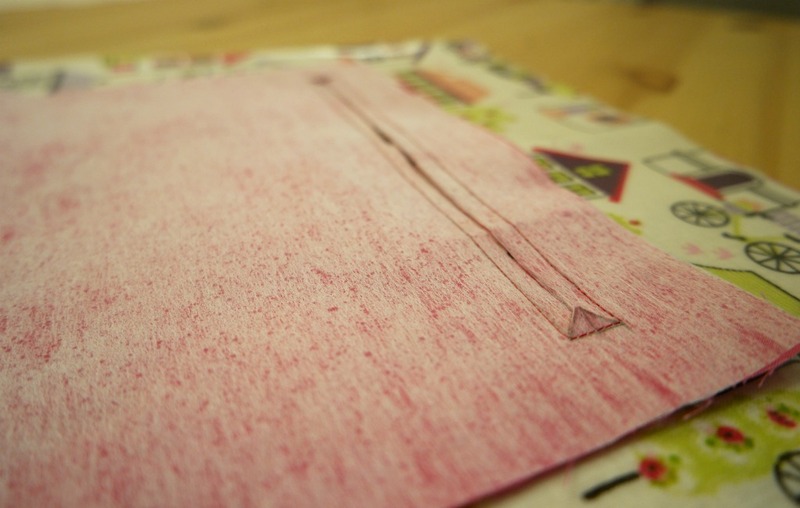 Sew the sides and the bottom of the pocket to the front outer piece, over the top stitching on the bias binding. 2. If the gusset is in 2 pieces join them at the short ends to make a longer piece. If you are using a directional print, join them at the bottom. 3. Starting at the centre of the gusset and the centre of the bottom of the bag, pin the gusset (don’t forget the interfacing) to the bag front. Sew. 4. 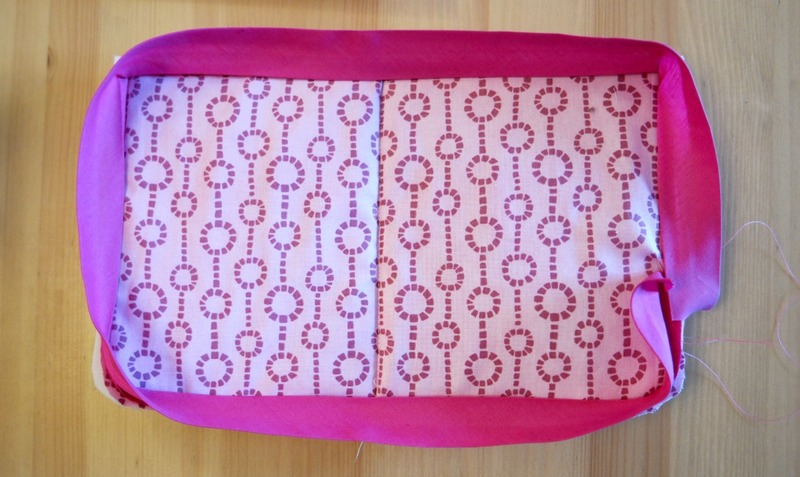 Pin the gusset to the back piece, with the interfacing, in the same way. 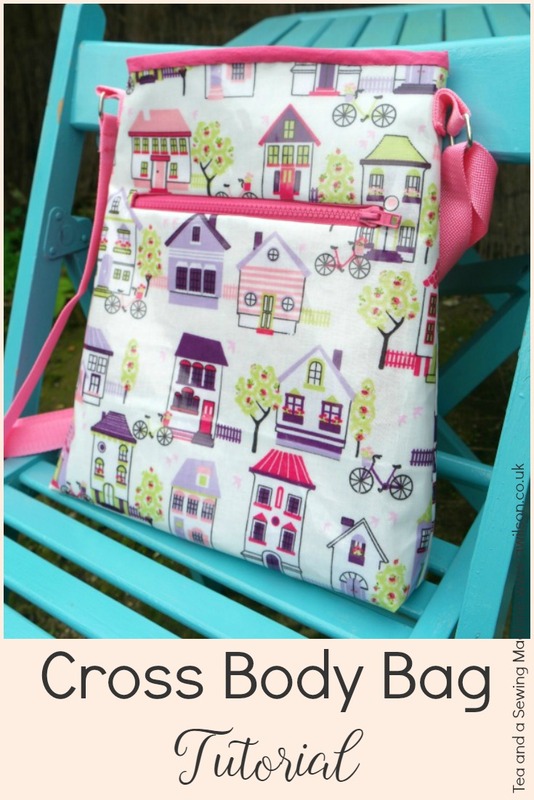 Sew the gusset to the bag back. 1. 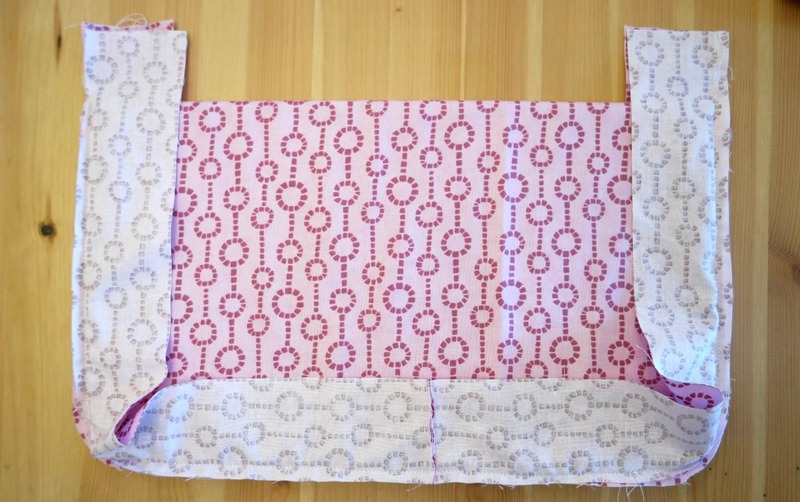 If you’re using Soft and Stable, fold the piece of fabric for the divide over the interfacing. 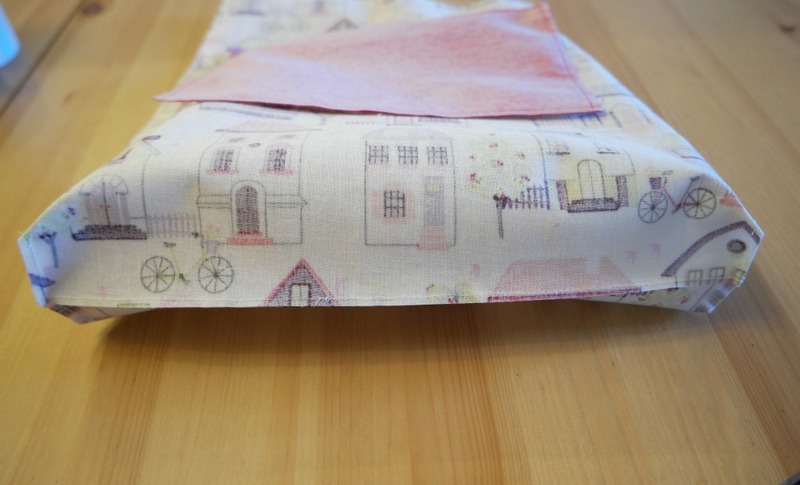 If you are using an interfacing that is not very thick, fold it over with the fabric. 2. If you need to join the gusset sections, do that now. 3. Pin both halves of the gusset to the divide, with one on each side. Sew. If you find this too fiddly, you could sew the gusset pieces to the divide one at a time. 4. Pin, then sew the lining front to the gusset, as you did for the outer. 5. Attach lining back to the gusset in the same way. 1. 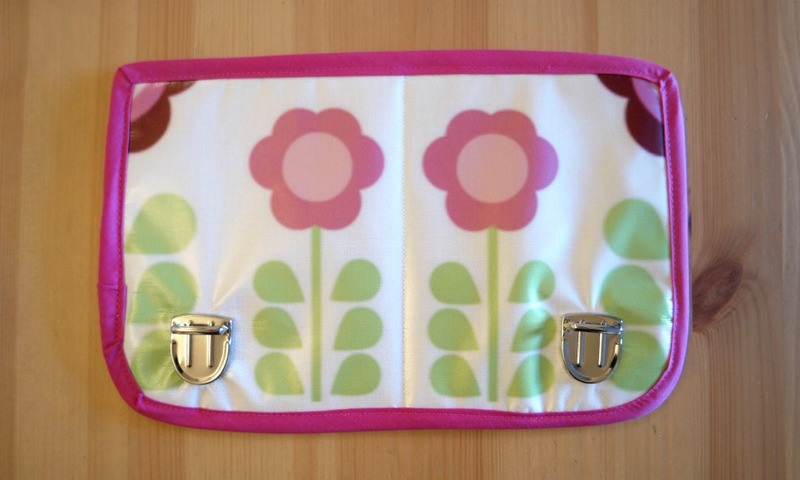 Place the lining and the outer flap pieces with the wrong sides together and the interfacing in the middle. 2. 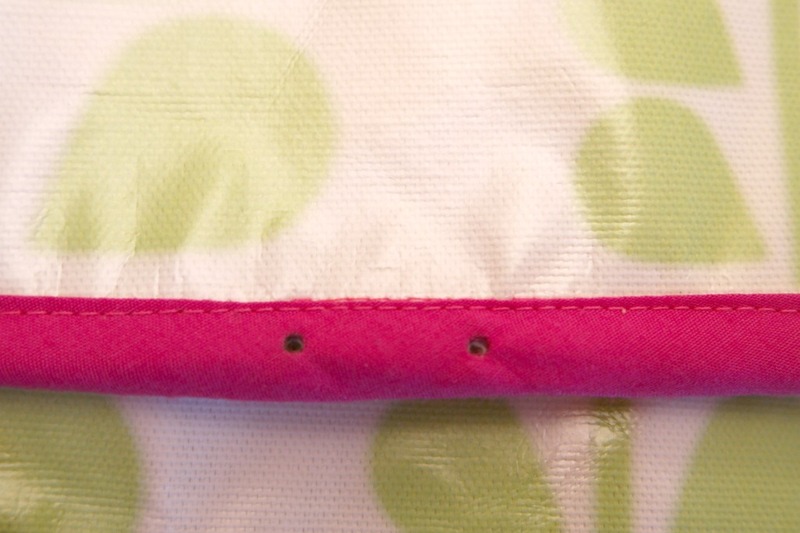 Starting on the wrong side of the flap, sew the bias binding to the sides and the bottom. 3. Fold the bias binding over the raw edges. Top stitch it to the front of the flap. 1. Pop the lining inside the bag so that the right sides are together. 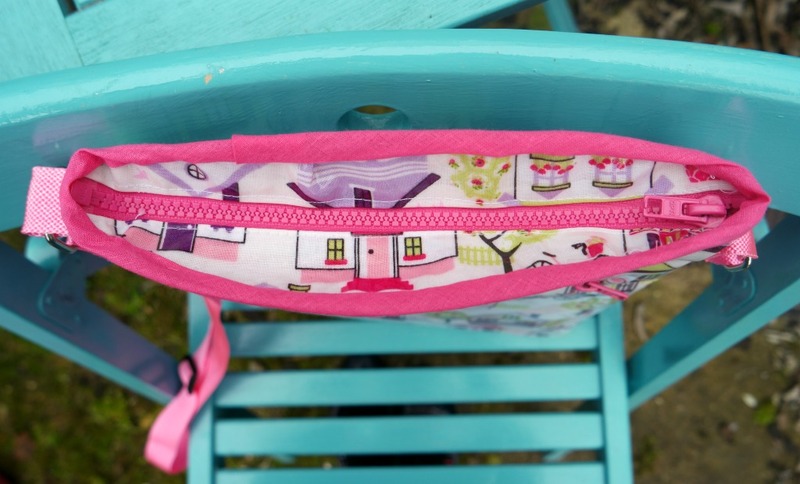 Pin the lining to the outer at the sides and the front (if you’re using oilcloth, remember to pin inside the seam allowance). 2. Sew the lining and outer sides and the front together. Turn it the right way out. 3. 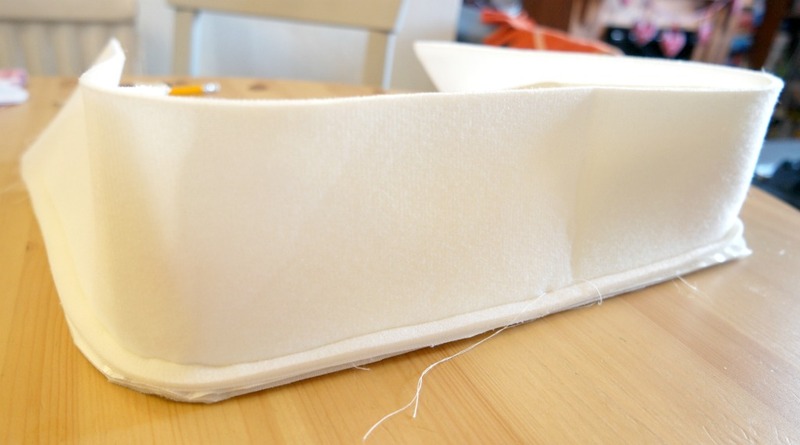 To attach the flap, it depends on what interfacing you are using. 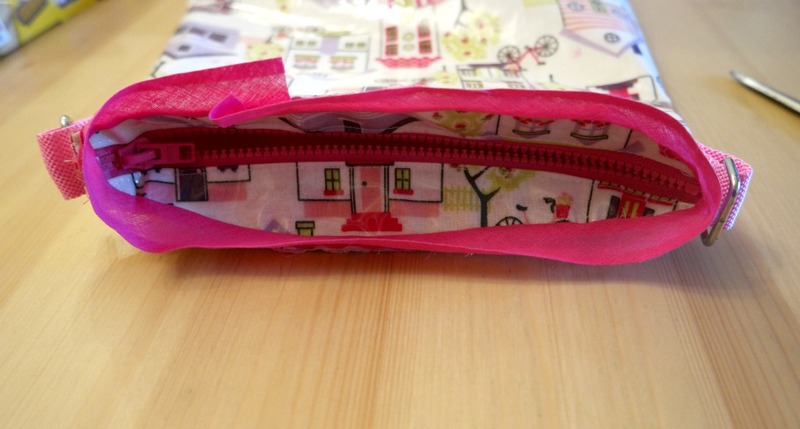 If you are using the regular stuff that’s not too thick, slip the flap in between the outer and the lining. Fold the raw edges of the outer and the lining inwards. 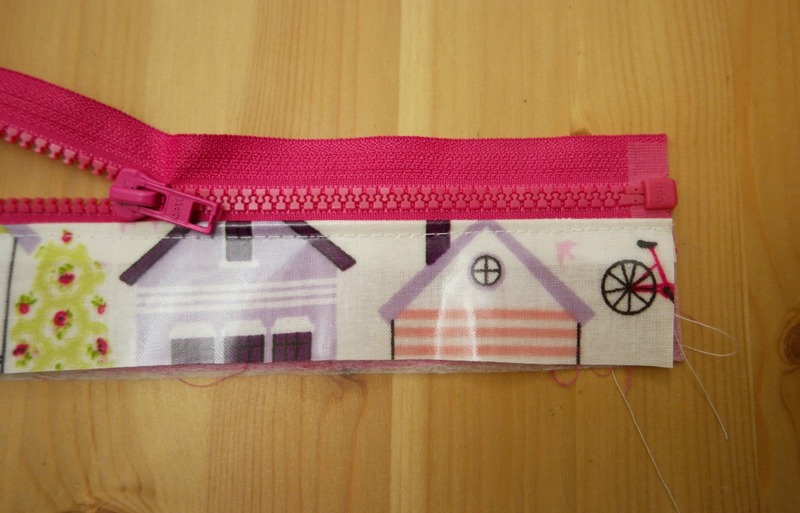 Sew the flap in place. If you’re using Soft and Stable, you might find this way a bit tricky as it’s so thick, so here’s a second way. 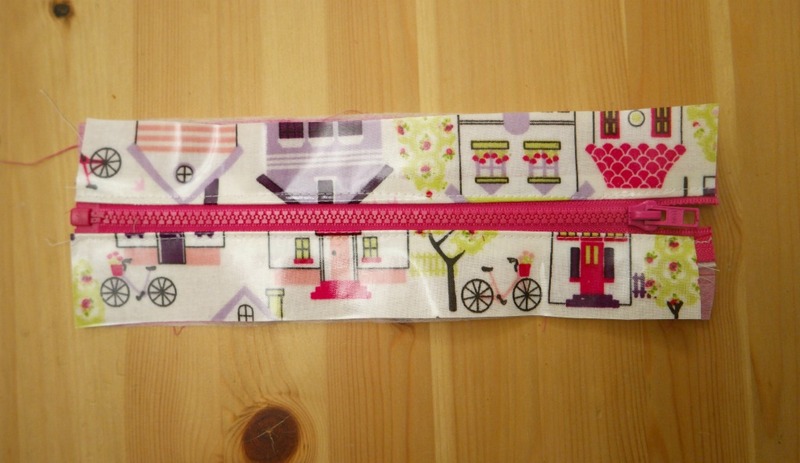 With the outer sections together, pin the flap to the bag outer keeping clear of the lining. Sew. 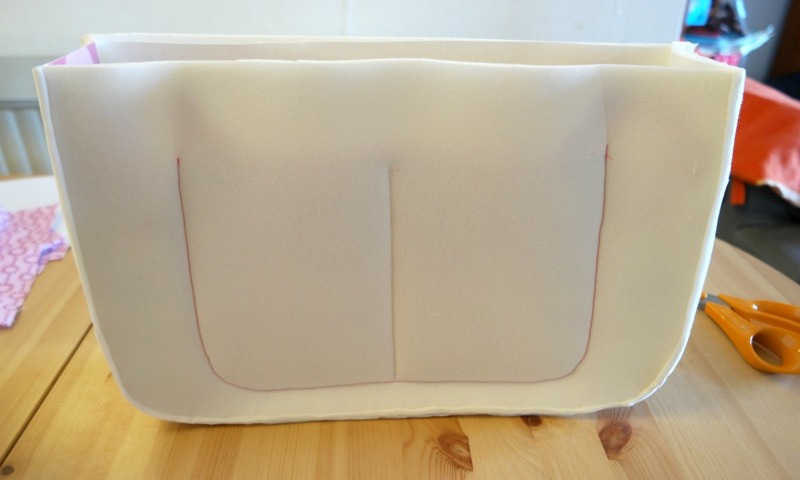 Bring the flap up so that the seam is pointing downwards, between the outer and the lining. 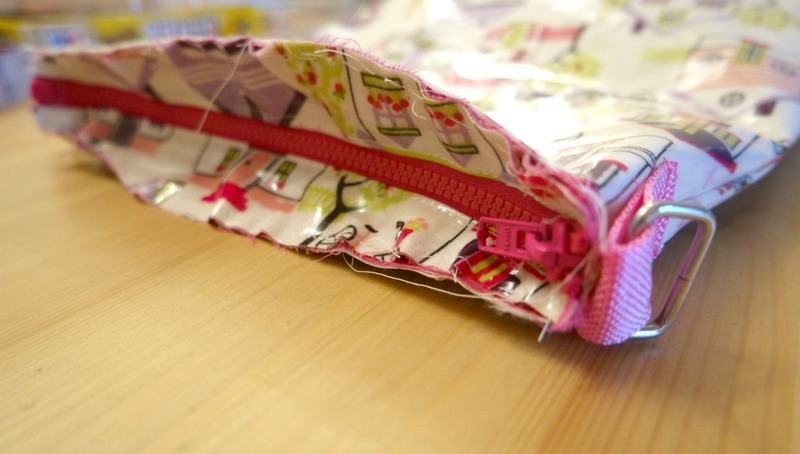 Fold the raw edge of the lining over and pin to the flap. Sew the lining in place. You could either use the machine or you could sew it by hand. By hand will be neater :). 4. 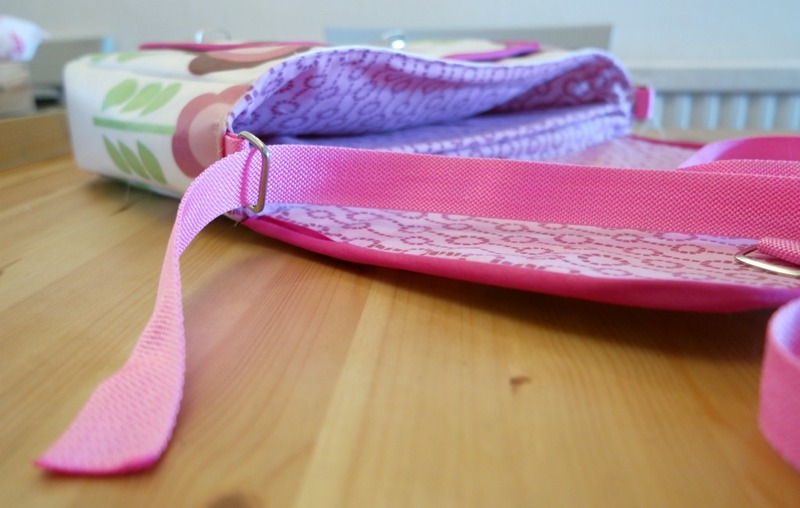 Top stitch round the sides and front of the bag. 1. Slip 1 of the remaining sections of the tuck locks onto the bottom of the flap. It is possible to open the tuck lock out slightly if you need to. 2. Line it up with the section of the lock attached to the pocket. Mark where the holes are with a pen. 3. Remove the tuck lock and make the holes. Officially you should probably use an awl. I don’t have an awl so I used to pointy bit of the unpicker to make the hole, then enlarged it with a knitting needle. 4. Slip the tuck lock back on. 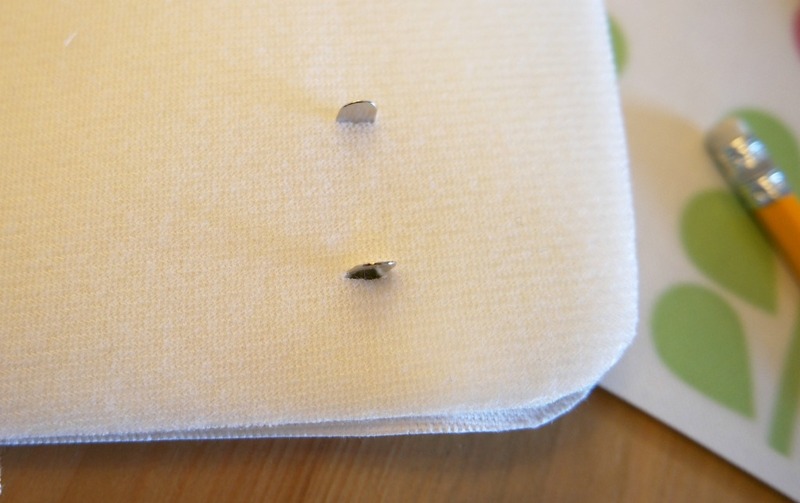 Push one of the little pins through the holes in the tuck lock and the hole you made in the fabric. 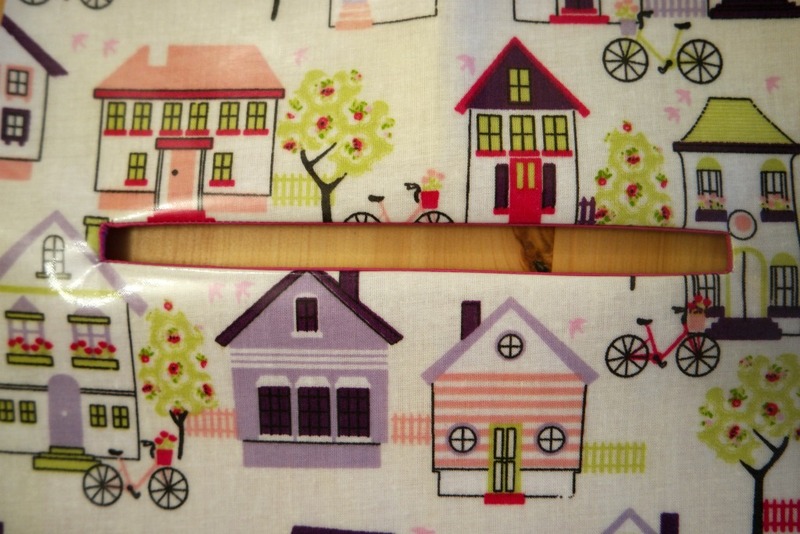 If the hole isn’t quite big enough, stick your knitting needle/ awl through the hole again, no need to remove the lock. Do the same with the other pin. 5. Pop the back onto the end of the pin. Repeat with the other lock. This part is fiddly, so it might take a few attempts. 3. 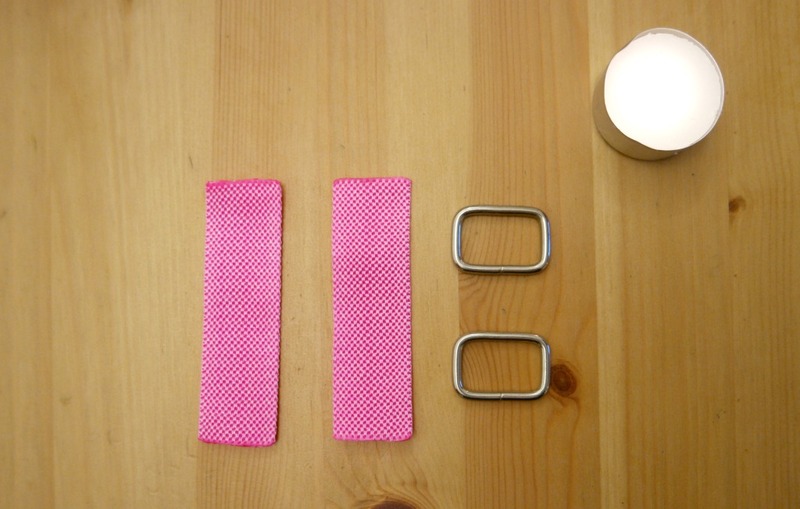 Unpick the stitches on one side, at the centre of the gusset. Pop one of the folded webbing pieces in between the lining and the outer. Sew the webbing in place, over where you unpicked the stitches. 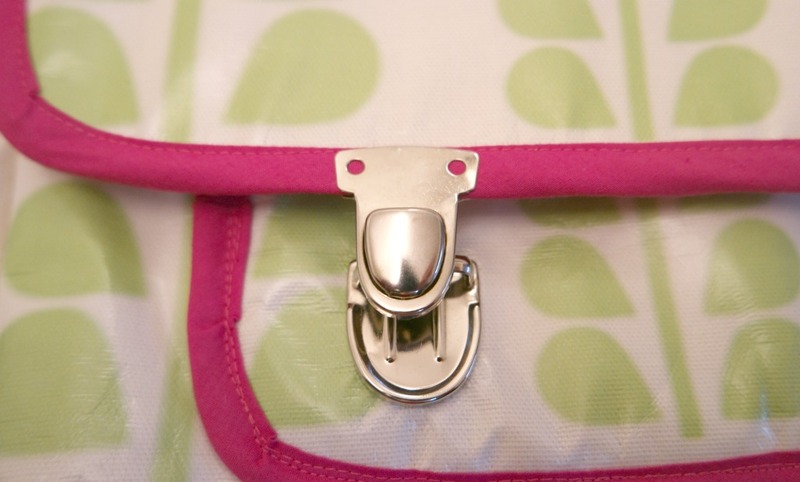 Trim away any stray threads and your bag is ready! 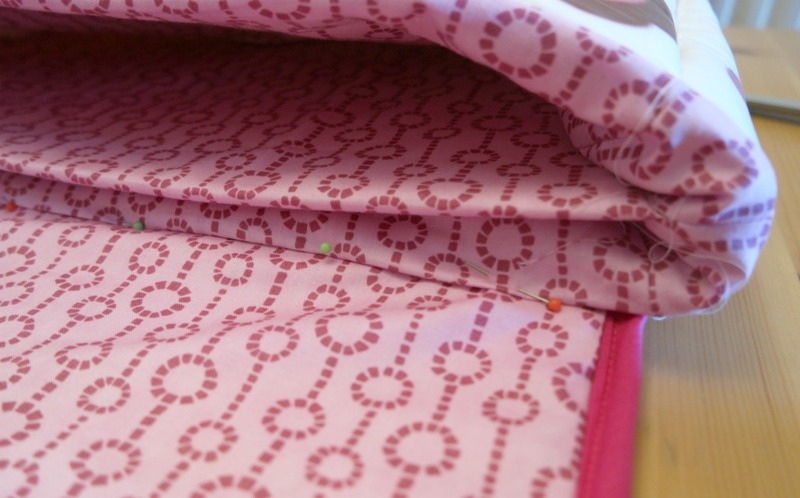 If you’re sewing with oilcloth or laminated cotton, remember to pin in the seam allowance. 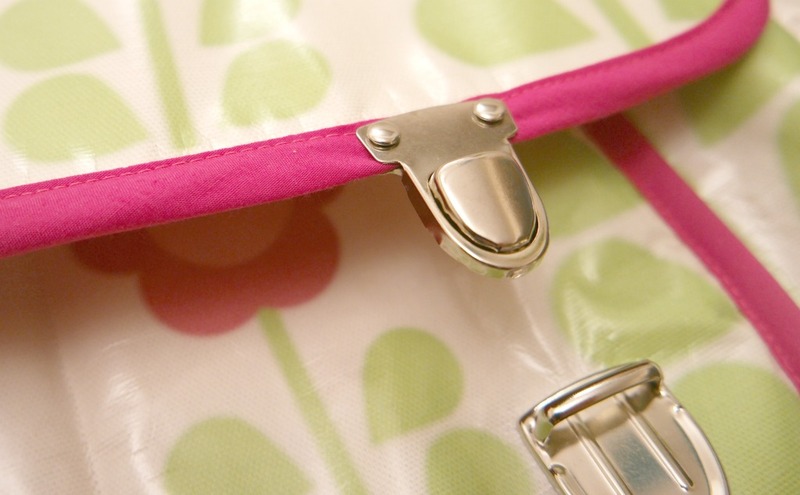 If you need your bag to be a certain size, just change the size of the pieces accordingly. Attaching a tuck lock can be fiddly, but don’t give up! It took me several attempts and it was worth it! Leaving the divide out will make it easier and quicker. You could add an internal pocket instead if you wanted to. 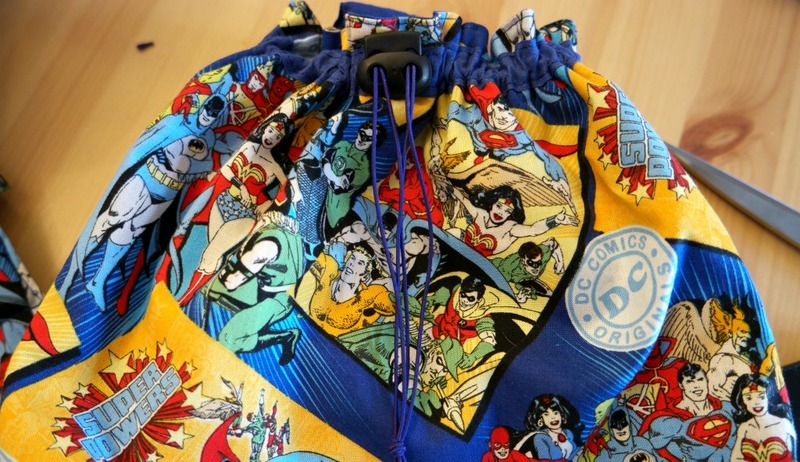 Without a divide, you could sew the webbing tabs for the D rings to the outside of the bag. 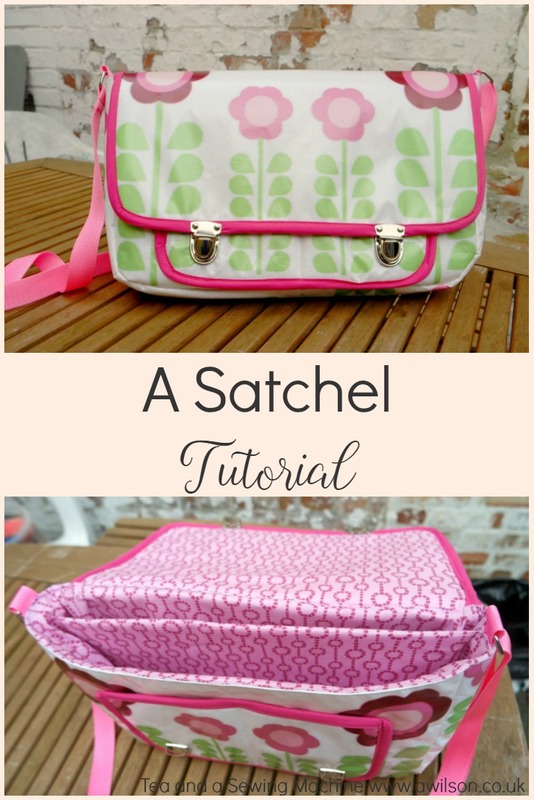 If you liked this satchel tutorial, you might also like these posts.